The joyful ramblings of a budding conservation ecologist! A scallop created by the removal of weakened sycamore opened the canopy for a young oak. Last week took us to the end of February and with it the end of the woodland work that we routinely carry out in winter on the Pitsford reserve, avoiding disturbance to breeding birds in the coming spring. We raced against time in the crisp winter air to fell the last of some sycamore and conifers that could pose a hazard to folks on the paths, taking care to leave a selection of stumps, log piles and brash to create new habitat from the destruction. There is still plenty of standing deadwood left deep within the wooded compartments for the benefit of invertebrates and the woodpeckers that predate them! Later in the week I took a rejuvenating walk to four of the ponds on the reserve in the steady pouring rain. As a licensed Great Crested Newt surveyor, I am preparing to survey the ponds on the site. Despite the deluge, I was toasty warm, wrapped up in plenty of layers and I enjoyed browsing the sites many beauty spots on my walks between ponds, taking in the last snapshots of their wintry character. 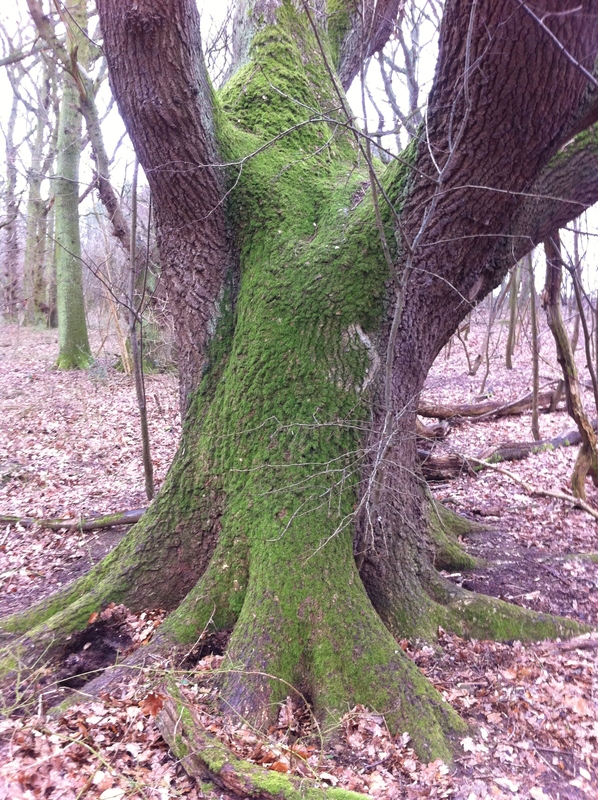 One of the larger Oaks in The Cover carpeted in bryophytes. The Cover hosts the oldest trees on the reserve. 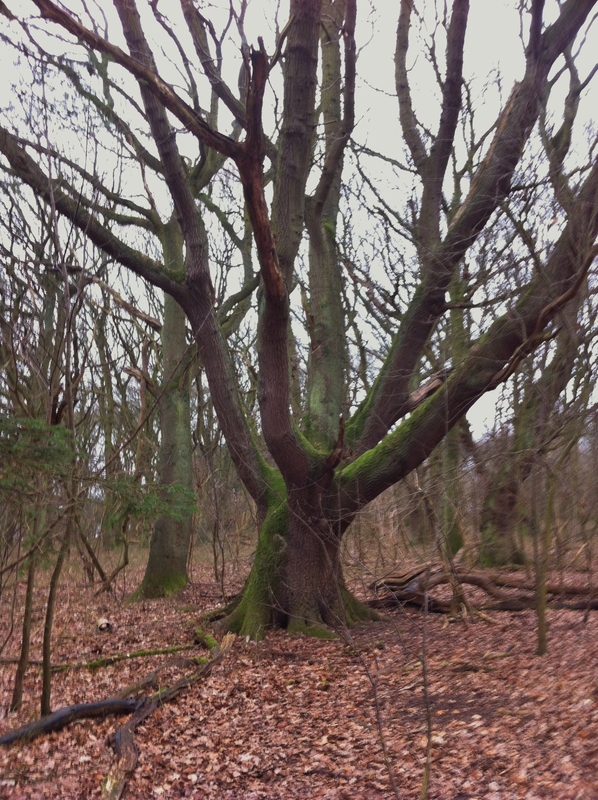 A favourite area of mine is a section of woodland known as “The Cover”, consisting of a stand of mature oaks that pre-dates the construction of the reservoir in the fifties. Some of the largest oaks stand over 15 metres tall with trunks over a metre in diameter at chest height. It occurred to me some of these majestic organisms have stood here since the 1800’s, silent sentinels to the changes of the surrounding landscape. They have witnessed the industrial revolution, survived two world wars and withstood the surrounding pastures’ conversion to intensive agriculture and postwar forestry. I wonder at what they are yet to witness in their senescence and I hold a glimmer of hope that their saplings grow to surpass them on the safety of the reserve in perpetuity. The ponds on the reserve appear to be on pause, it’s only an illusion, growth continues very slowly in the chill, but as the days lengthen, the warming waters will explode with life. Green mats of floating vegetation and spikes of emergent reeds, rushes and irises will host the embryos and larvae of invertebrate and amphibian life, the latter of which I seek to record. Walgrave pond has a stand of reed and rush along its shallower bank. There are historic records of Great Crested Newt Sightings from torch surveys carried out some years ago. Frogs toads and smooth newts have been documented in recent years and I have found smooth newts in the car park and woodland last autumn. I carry out initial habitat suitability assessments of the ponds, all differing in size, character and plant cover. This helps me understand the potential these habitats have to support different amphibian species. I plan to return to further investigate the invertebrate biota; as indicators of water quality and also to see if the dreaded rumours of fish are true! Fish predate newt larvae and would make breeding difficult, however a dense stand of vegetation may offer some protection and toads noxious offspring aren’t predated by fish as much, so all is not necessarily lost. Spring pond with a recently coppiced willow and the arising log pile refuge on the reed beyond. Even suboptimal ponds can provide viable breeding grounds or at least food supplies to adult amphibians. My goal for the coming season is to assess what’s in the area and identify what might be done to improve the existing ponds for as many species as possible. So in anticipation of spring, I begin to plan the best areas to scan by torch light during the warmer evenings. I identify the Glycerias; floating sweet-grasses, in which I hope to find little parcels of embryos within neatly folded leaves by egg laying female newts. I visualise the most effective paths to take when netting the ponds and wonder which will yield amphibian larvae or the prized larvae of the Odonata; dragon and damselflies that are know to inhabit the site. I recognise which banks can have have the conventional staked bottle traps and which will need floated, shore anchored traps. Eyeing up the log piles that I’m going to peek under when things warm up, I can’t wait to come back!